Small tractors are a big investment, and there are dozens of models to choose from. There’s a lot to consider before you part with your hard-earned cash. If you’re shopping for your first tractor, figuring out what you need is intimidating. You already know you don’t need a monstrous machine that costs a fortune. A lightweight compact tractor with a smaller price tag can do the job. But how do you know exactly what you need? Who are we to tell you how to buy a tractor? – nearly every week we meet people who have bought the wrong tractor or outgrown their tractor. We hear their stories and help however we can. In many cases, we wish we’d been there to give our advice before the purchase. The right compact tractor is a versatile workhorse without equal, a single piece of equipment that can help you complete a huge number of tasks. The wrong one simply won’t meet your needs. Here’s what you need to know. Buying a compact tractor bearing one of the top brand names has some advantages. 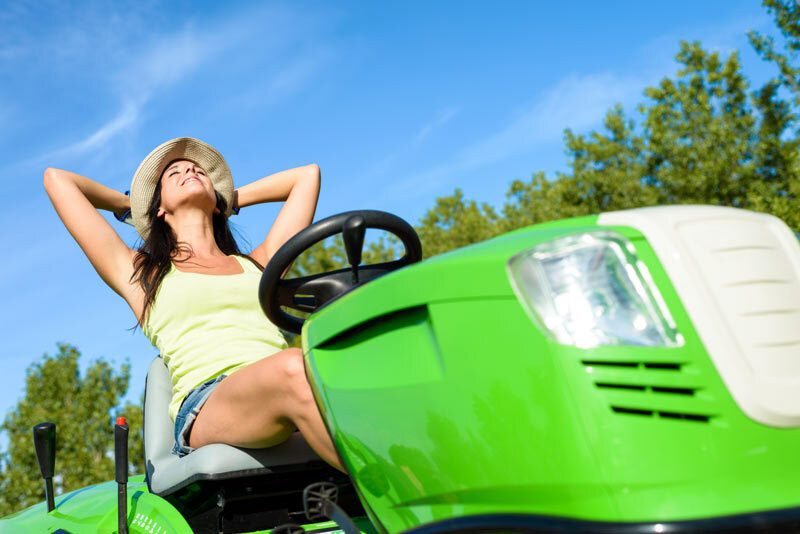 The big brands offer better reliability and service, and the resale value is best for brands people recognize, like John Deere or Kubota. When it comes to compact tractors, the brand is more than just an iconic color, it’s history. That means that brand name tractors always come with a higher price tag than lesser-known brands, right? A common misconception is that well-known brands are priced higher. I can think of at least one scenario where a Kubota compact tractor is not only better, but actually cheaper than its low cost overseas competitor. When you purchase a lesser-known brand at a bargain price, you’re quite possibly paying more over the long term. How is that? Consider the true costs. Typically the company’s dealers are smaller and weaker and may not be here tomorrow. When that happens, you’ll find yourself in serious trouble with no parts, no service and no trade-value. A simple rough formula you can use to compare tractors is to take price of tractor and divide it by weight to get the price per pound. The first important consideration is to determine your needs. We often see buyers come in when they are faced with a specific task. Buying a tractor with one task in mind is a great way to waste a lot of money. Think of your equipment as a long-term investment, not a short-term priority. What can your tractor do for you after the immediate job is completed? How steep or gentle is the terrain? What’s your goal and what’s the job it’s going to do now? What can you use your tractor for in the future? How much time do you want to spend completing the task? Reputable dealers are knowledgeable people with experience. Your dealer should offer full service. In addition to a variety of quality products, you want people that know their product, and can advise you and provide service and parts. If your local dealer is more interested in making the sale than in making sure you buy the right equipment, walk away. One way to gauge the quality of a dealer is by its customer service reputation. When a dealer is well-known in the area and customers are happy with their service, they will spread the word. Look for testimonials and reviews, and pick a dealer who has been around a while. What are the biggest considerations when buying? After you’ve nailed down the type of compact tractor you need, it’s time to consider the nuts and bolts. How much tractor do you really need? Here are the features you should consider before making a decision. Horsepower is one of your most important considerations. The higher the compact tractor’s horsepower, the more you can pull and haul. How much power you need really depends on the job and the terrain. The bigger the scale, the bigger the engine you’ll need. I like talking about horsepower because it’s so important and so misunderstood. Why? There are three types of horsepowers that come into play when buying a compact tractor. First, understand what type of horsepower the dealer is talking about. Engine horsepower (or brake HP) – this is when the engine is working by itself with no attachments or auxiliary parts, like a water pump or a gearbox. PTO horsepower (power take-off HP) – the most common measure used to describe tractors. It’s the amount of power generated at the power take-off shaft – how much you have when spinning. To pull a cutter or mower through dense crops and terrain, look at PTO. Thick grass and hills eat it up. I believe this is a dying metric because people always want to quote the horsepower number that’s higher. Drawbar horsepower (or draft HP) – the measurement of power generated by the tractor to the attachment, usually equal to about 85% of the tractor’s PTO HP. It represents the pulling power when a trailer is hooked up. Manufacturers use drawbar HP to describe power in tractors that don’t have a power-take-off shaft. See how you could buy a 50 HP John Deere and a 50 HP Kubota and one could be stronger than the other? Remember this. When pulling weight, drawbar horsepower is important. When bush hogging, PTO horsepower is most important. If you are going to make a mistake, always make the mistake of buying too much horsepower. Compact tractors are small and lightweight by definition. A heavy load or moving with the loader in the air can make the machine top-heavy, especially if you’re working on a slope. A rollover protection system (ROPS) with roll bars and seat belt is a critical concern. Roll bars are the structure built to protect the driver from being crushed in a rollover. The seat belt keeps the driver anchored in case of a rollover. Understand that one is no good without the other. Unlike a car moving at high speeds, an unbuckled tractor driver will always be thrown down hill and not far from the vehicle. If there is no rollbar, don’t use a seat belt. Ag (R1) – Agricultural tires used in most farming applications. Great traction for mud or slopes. The angled tread pattern sheds dirt and mud better than the tread designs but has a shorter tread life. Industrial (R4) – More of an “all-terrain tire” with trackless operation. Good traction for reasonable, non-extreme conditions. Used by contractors, landscapers, and homeowners. 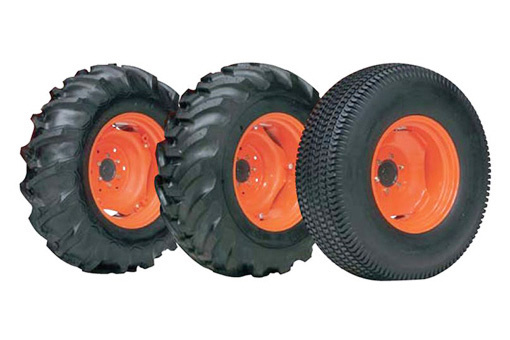 Extra width make these tires provide a good base for loaders and are easy on your grass. R4 tires are used in most construction applications. They are tough and long lasting but not as aggressive. Turf (R3) – Most commonly found on riding mowers, turf tires are used by golf courses because they are easy on the grass even if the grass is soft and wet. They are wide and have shallow tread depth, and provide the smoothest ride. Your choice depends on the job you need performed, and the conditions or the terrain. Gear transmission uses a clutch and manual shift change gears and speeds. Gear transmissions are lower cost than other options. You’ll recognize it by the grinding sound. Hydrostatic transmissions are often incorrectly compared to the automatic transmission in cars, and they aren’t really the same except in ease of use. With hydrostatic transmissions, there is no clutch or gears aside from the center, or neutral, position, disengaging the engine. You control speed and direction (forward or reverse) with your foot. Shuttle transmissions have a high and low range, gears 1 through 4 with a lever on the steering column. A key feature for shuttle is that there’s no hunting for reverse! The driver can go forward and backward at the same speed without ramping up. This is quite convenient for chicken house tasks where you don’t want to start in low gear. Shuttle transmissions come in two types: mechanical (clutch) and hydraulic (no clutch). The usefulness of a tractor is in the many things you can hook to it. You’ll need a tractor with the right range of implements that meets your needs. And before you decide, find out how easy the attachments are to hook and unhook. In the past, little thought was given to comfort. Your Grandpa’s tractor was pretty basic – a hard metal seat exposed to the blistering sun and rain. Modern compact tractors offer far more ease of use options designed to keep operators healthier and happier at work like radio, power steering, ergonomic controls and placement and comfortable seating, with some including seat suspension to reduce impacts from rough riding. If you’re going to be spending a lot of time in that seat, it’s a good idea to get cab features that save wear and tear on your most important equipment – your body. A comfortable seat and surroundings helps reduce operator fatigue, and that means fewer mistakes and increased safety. You can also look for other safety features, like a seat belt, hazard lights, and a slow moving vehicle (SMV symbol) for when you have to take it on the road. My advice? Don’t worry about the color so much, worry about how it feels and if it fits you. Worry about the controls and where they are and if they are labeled to suit your needs (that lever that keeps poking you in the leg is going to make you miserable). If not, find a tractor that does have everything where you want it. For goodness sakes buy a compact tractor with power steering, especially if you have a loader. No power steering will take all the fun out of using your tractor. The best way to gauge comfort is by test drive. Saddle up and try before you buy! No matter which brand and model you buy, new compact tractors come with a warranty. Some will be better than others. Many manufacturers only offer a 12 month warranty. John Deere and Kubota offer 6 year warranties. Understand that manufacturer warranties only cover labor and parts. They don’t include pickup, deliveries, freight or fluids. If a seal is going bad and leaking transmission fluid, the manufacturer warranty doesn’t pay to have it put in. Also, be aware that there are different types of warranties. Did you know that some tractor manufacturers offer warranties that are only for consumer use, not commercial? Pay close attention to this. Just because a tractor company advertises a 6 year warranty does not mean it’s a 6 year warranty. Some are also power train warranties. And almost none cover batteries for six years. Used compact tractors may also come with a warranty or a guarantee by the seller. Find out what services your dealer is willing to extend and how long you’re covered. Some dealers consider their obligation over as soon as the check is signed. Others will offer help, advice, and repair within reason for an extended time. Many customers seem to think tractor packages are offered by the manufacturer. Not true. Packages are assembled by the dealer, and they aren’t always a great deal. You’re not getting a bargain if a low-priced package includes a cheap tractor that won’t do the work, and accessories you don’t need and can’t use. 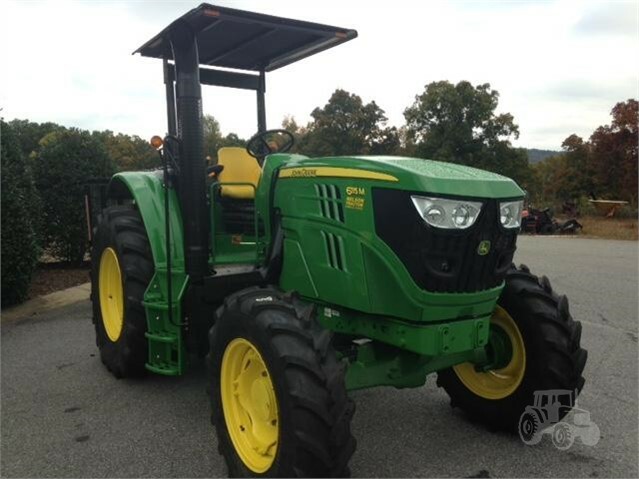 Dealers might package tractors that aren’t selling just to get them off the lot. Think twice before you buy a hard sell on a “great package deal.” Making a hasty decision based on what appears to be a bargain price could be a costly mistake. 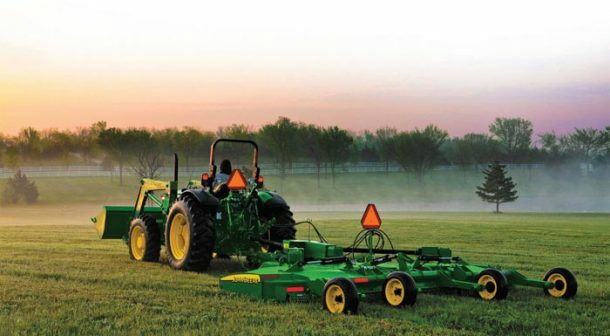 Pick the tractor you need…and then talk deals. What does a great deal look like? The right tractor with the attachments to fit your needs at an affordable price, backed by stellar service. Nelson Tractor Company puts together custom packages for our customers, tailored to meet their precise needs. Let’s be honest. Most people know that packages are a way to get customers in the door. Low price is not always the best deal (recall that a big brand tractor can actually be cheaper than a comparable lesser-known brand). Put extra scrutiny on “ready-to-go” deals. Don’t get too excited about driving into the sunset with a trailer with a tractor, loader and bush hog. Don’t buy it if you don’t need it. Getting your equipment financed is similar to making other large purchases. You’ll need to understand terms and interest rates and purchase insurance for your newly acquired property. With this much money on the line, finance companies are careful. Some customers come in with confidence, knowing they will be approved. Others are nervous, and usually have reason to be. Finance companies will want to look beyond your score, at your comprehensive credit picture. Your score is only one factor. No credit history is as bad as bad credit, and slow paying loans will hurt you. If you have marginally good credit, or no credit, you may be able to bring in a co-signer. People with bad credit, though, can’t. And the better your credit, the less you’ll have to put down. Financing for long periods of time, up to 84 months, can make low payments seem attractive, but it will limit your options for trading in or up in a few years. It’s easy to find yourself upside-down with a lot of time to pay. If you failed to do your homework and are stuck paying for the wrong tractor…ouch! Think twice before trying to save a few bucks a month with a longer term. New tractors and equipment need to have physical damage insurance to cover what’s on the contract in case of a loss. Nelson Tractor company is licensed to sell property and casualty insurance. The insurance we can sell you is typically cheaper and gives better coverage than insurance arranged from someone else. There are plenty of used compact tractors on the market, and if you’re on a tight budget, used might be the way to go. Much like cars, tractors depreciate a lot in the first two years, so you may be able to get a relatively new machine at a much lower price. Of course, when you buy a used tractor, it comes with some unknowns. You won’t know whether the tractor was properly maintained by the previous owner, or whether they lost control and drove it into a pond. Any manufacturer problems will be found and fixed early, so what you’re left with is anything stemming from user error or poor maintenance. With a new tractor, you know what you’re getting and you have a full warranty backing up the product. You can make sure maintenance is done and any issues are addressed. You have more financing options and lower interest rates with new equipment. No matter what you buy, you’re going to have an issue here and there, regular maintenance, and questions about your glorious new gadgetry. Your dealer is about to become your new best friend. He’s got the knowledge and advice you’re going to need. At least you hope so. Let’s be honest. For some dealers, it’s strictly about the sale and making the most money. At Nelson, we’re all in one service. We don’t hire “just anybody.” Our employees are fully trained and full of information about our products and everything that goes on in this area. We know the area, the people, and the industries, because we’ve been here for generations. Even if you’re brand new to the whole scene, we’ll treat you with respect and give you everything you need to know, even if it means selling you less expensive equipment than you come in for. Choosing a compact tractor is one of the most important decisions a landowner or hobby farmer will make. Your tractor is one of the most expensive and useful pieces of equipment you’ll ever own. To get the right size, the right power, the right attachments, and all the comfort you can afford, the first step is to find a dealer who asks the right questions and offers honest, reliable advice. Otherwise, you could wreck your budget over a shiny new toy you can’t afford and didn’t need, or be talked into a “bargain” without enough power to get the job done. Thank you for this article. It’s very helpful and I appreciate it. I’ve been shopping for a compact tractor for several weeks, and one thing I’m finding extremely frustrating is the utter lack of MSRP info from tractor manufacturers and dealerships. It makes me angry and frankly, suspicious, that no tractor manufacturers will suggest a price for their machines. I can’t think of any other piece of equipment where this is the case. Why are manufacturers afraid to tell people what their tractors cost? Is it to help the dealers make more money? It seems so. Thanks for the comment. The simple answer is this. Manufacturers aren’t going to dictate to the dealer what they have to charge for a piece of equipment. They recognize that dealer margins are different in different parts of the country so they let the dealers do the pricing. The down side is this creates less uniformity and credibility in pricing for consumers like yourself. Is it time for a change?? I think probably so but this is where we are today. Buy a Blue LS Tractor. Same as New Holland , save big time! Thanks for your comment about how a tractor should be the type that you are looking for. I also like how you said that they should have a good amount of horsepower. My father in law is looking fora compact tractor to use to take care of his land.